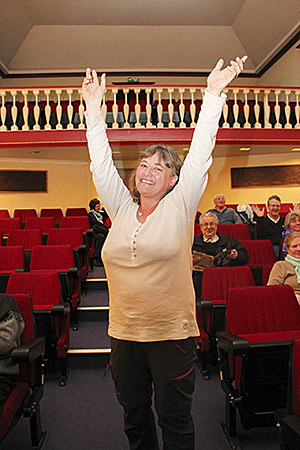 HAPPY: Ellen Herland (45) from Åsane was beaming with joy as the bodily pain disappeared after receiving prayer in Odda. For 27 years she struggled with fibromyalgia and osteoarthritis. For 27 years Ellen Herland lived in a painful existence with fibromyalgia and osteoarthritis of the body. During the meetings in Odda the pain disappeared instantly. Now she is in fully active and free of pain. When Ellen Herland from Åsane was 18, she experienced pain in the hips and knees. The condition was getting worse, and at times it was very painful to walk. She eventually contacted the doctor who thought it was osteoarthritis. As time went by another pain began to develop in her body. Electrical impulses of excruciating pain moved around to different points. This time it was unfortunately fibromyalgia that Ellen had been afflicted by. This disease is one of the most common rheumatic disorders in Norway, with around 160,000 people being plagued by it. The condition worsened. It hurt all the time. I constantly woke up during the night because of the pain. -In the morning I was very stiff. At times I could not dress myself, and I needed help. It could take several hours before my body began to function normally. I could not take painkillers, and it made everyday life even more challenging, she says. To begin with, Ellen worked independently, which allowed her to adapt more easily to everyday life. Over the years there were long periods of sick leave, and in the last period she was without work. Ellen was still active, but it had its price. -I always liked to go hiking and skiing. Sometimes I pushed myself to go for a hike, but it had its consequences. After skiing, I could be in bed for two days. Ellen had heard of Svein-Magne over the course of many years, but had never made contact. She thought that it was not her style. When Pedersen came to Odda, a friend recommended that she should go to the meetings. He himself had been helped through Pedersen's prayers. Ellen therefore went to the meeting with Pedersen. -As he was praying, I got a special feeling in my body. I became both hot and cold, and the pain went away. I could hardly believe it to be true and I was very touched. In the time that followed, Ellen was fully active. The pain in the body is gone, and the energy has come back. -I have a new everyday life. When I wake up in the morning, I'm just amazed every time over the fact that the pain is gone. Lately I have really been able to test out my body. I helped a friend who has a farm with both liming and fertilization. In addition, I have been skiing in the mountains and the body is in good shape. A few weeks ago I went on a trip to China. Here I went for a long walk on the Great Wall. Life is new for me, God is good, Ellen concludes. © 2006 Jesus Heals ministries | All rights reserved.